Last year's Makeweight was a pretty good success for Furthermore, a moderately hopped Belgian Pale Ale, it further laid on the table the modus operandi for what is quietly becoming one of the more innovative breweries in the state. Earlier this year, we learned of head brewer Aran Madden's strange predilection for the Bud Chelada, an allegedly Mexican-influenced beer that we just can not get with. But, that's not to say the fine folks south of the border have nothing to add to the beer conversation. Indeed, it seems like everywhere we turn everyone is jumping on the Mexican beer bandwagon. But, it's a fine line to toe. On one side of the line, is Dos Equis, a fine Mexican vienna-style lager. On the other side, is Bud's disaster of Land Shark Lager, which seems to have, as they say, jumped the shark. Indeed, many of the original Mexican lagers have a unique brewing history that perhaps accounts for some of the discrepancy, that certain je ne sais pas, that prevents many of the Mexican clones from tasting "right." While Anchor claims that the "steam" beer was invented by them, and maybe it was, the Mexicans have been warm-fermenting lagers for quite some time. Typically, lagers are cold fermented around 40 to 45 degrees or so; it's partly what gives them that "clean", non-ester-y, taste. However, some lagers can be warm-fermented, set in temperatures closer to 62 degrees or so. While they are still bottom-fermenting, they take on some of, but all of, the warm fruitiness typically found in ales. This Mexican-style, warm fermented lager, is what brewer Aran Madden has made - A brown warm-fermented lager in the Dos Equis and Negra Modela tradition. Light and mildly caramel with a medium body, a beer with more flavor and oomph than the paler versions typically served with a lime in the bottle. This coffee beer is more "iced coffee" than "double-mocha-mud". I started with a brown Mexican lager to compliment the coffee of choice, Nicaragua, from La Fem Co-op, roasted by Just Coffee of Madison. Flaked maize was added for creaminess, and to appease the sun gods. An extra-warm fermentation lets the yeast create more interesting flavors (the California-common effect, or Vapor Beer, if you speak Beer-Spanglish). Bitterness was increased as a counter point to the sweet flavor of un-brewed coffee--whole beans are soaked in the beer during cold maturation. The alcohol extracts and retains aromatics that would otherwise be lost to hot water. My hat is off to Just Coffee, whose product (and presence) warranted a new approach to coffee beer. Ed Note: laying corn-products at the feet of the gods is an effective form of sacrifice. In a drunken rage over the ferocity of the wind, I once participated in the sacrifice of Tostitos to the wind gods. It worked. This beer, dubbed Oscura, was unveiled last Saturday at Furthermore's Second Annual Sh*##y Barn Party out in Spring Green. It was a firm beer that steps aside and lets the coffee be the star. While most other "coffee beers" are stouts or heavier beers meant to use the coffee to aid in drawing out the roasted malt notes of the beer, in this case, the beer is a vehicle for bringing the aromas and flavors of the coffee to you. I didn't detect much of the alluded to creaminess, but that may have been due more to the shock of the coffee flavors and the less-than-ideal formal tasting conditions than anything else. You will be able to find out for yourselves sometime in mid-July as Furthermore expects the Oscura to hit stores sometime between July 10 and July 17. 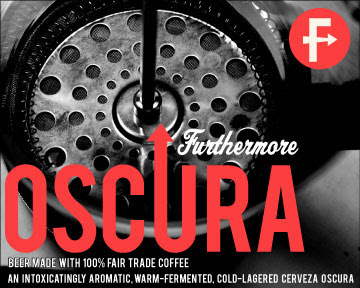 Oscura literally means "dark" in Spanish. Of course, the name immediately evokes the Camera Obscura, a large dark room with a single pinhole that served as a camera in the early days of photography, until you recall that there is no "b" on Furthermore's label. Other references to Oscura are found throughout Latin American literature and film, including the poem La Noche Oscura ("The Dark Night of the Soul") by renowned Spanish poet San Juan de la Cruz and written in the mid-late 1500s. According to Wikipedia: "[La Noche Oscura is] widely considered to be among the best poems ever written in Spanish. … Dark Night of the Soul (from which the spiritual term Dark Night of the Soul takes its name) narrates the journey of the soul from her bodily home to her union with God. It happens during the night, which represents the hardships and difficulties she meets in detachment from the world and reaching the light of the union with the Creator. There are several steps in this night, which are related in successive stanzas. The main idea of the poem can be seen as the painful experience that people endure as they seek to grow in spiritual maturity and union with God." So, Furthermore. Think your beer lives up to that? It was super coffee-y. Granted, I hate coffee, but it was not "hmm, this beer has a hint of coffee to it." It was "Holy crap! Coffee!" I expect to have an experience akin to infused contemplation when partaking of this brew. Not uninterestingly, "The Dark Night of the Soul" was source for Douglas Adams' "long, dark teatime of the soul," first referred to in HGTTG, then the title of another book. Whether FmB "lives up" or not, well I'll leave that up to the aesthetes, aescetics and sci-fi enthusiasts. All I know is that when my lack of belief in God becomes an issue for God, I'll sure want a delicious beer in my hand. And a coffee stout won't stand a snowball's chance in, well, Hell. So make it thirst-quenching coffee beer for the trip, yo! Show me the way to this beer. I want. And just to clarify, the Chelada is indeed a Mexican concoction. Bud just won the race to use the name first. I'm really looking forward to this beer. Great review.